I stopped at a farm stand to take advantage of the (boohoo!) ending peach season. Luckily they still had some yummy peaches left, but they had to be eaten quickly. They were ripe and ready! There were more peaches than we could eat, and I was not able to can the peaches and put them up. I had to get creative. Time to dig thru the pantry and the fridge for more inspiration. Ah yes, onions. Sweet summer Vidalia onions were in a basket in my pantry. And chicken was in the fridge ready to grill. What could be better. Luckily, there was also leftover pesto pasta in the fridge too. So here we go. I fired up the grill. But the chicken would go on second. What to grill first? Why, the peaches and the onions, of course! I sliced the 2 onions about 1/4 inch thick. I sliced the peaches in half and removed the pit. Next, I laid them on a cutting board and sprayed them with a bit of vegetable oil. 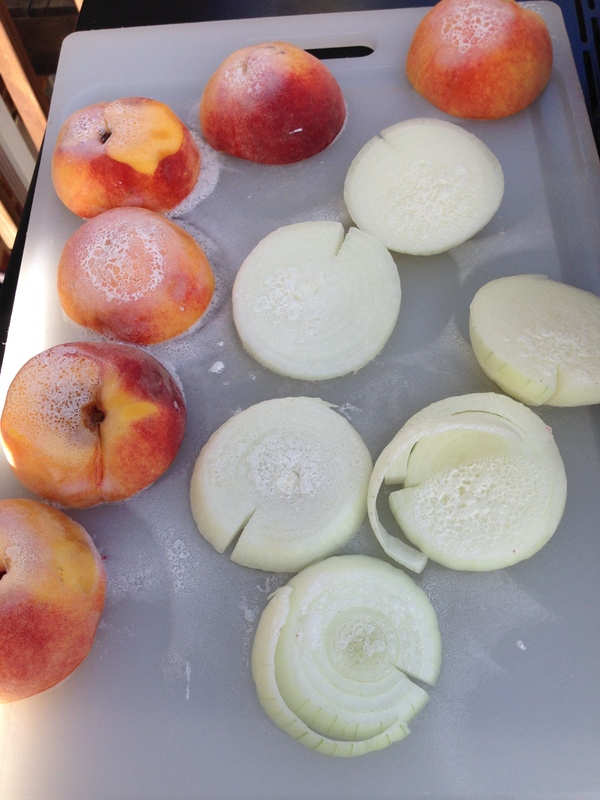 Sliced onions and peaches getting ready to grill. Onto the grill they went. The heat was good and high to get a quick char and that desired carmelization that only the grill can provide. I wanted those sugars in the peaches to get to work! And they did not disappoint! 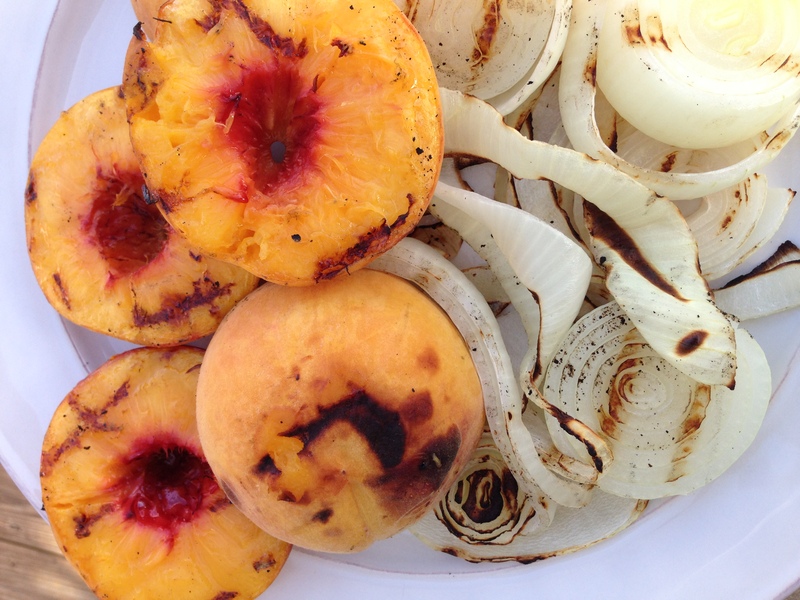 The onion slices and peaches went onto that hot grill. The beginning of some great grill marks! The scent that wafted from the grill was absolutely mouth watering! It certainly produced one of those culinary “moanable moments”. When that happens, your eyes close, your head falls back a bit, and a deep breath in is amazingly delightful. Those sizzled on the grill for about 3 minutes per side, then they came off the heat. 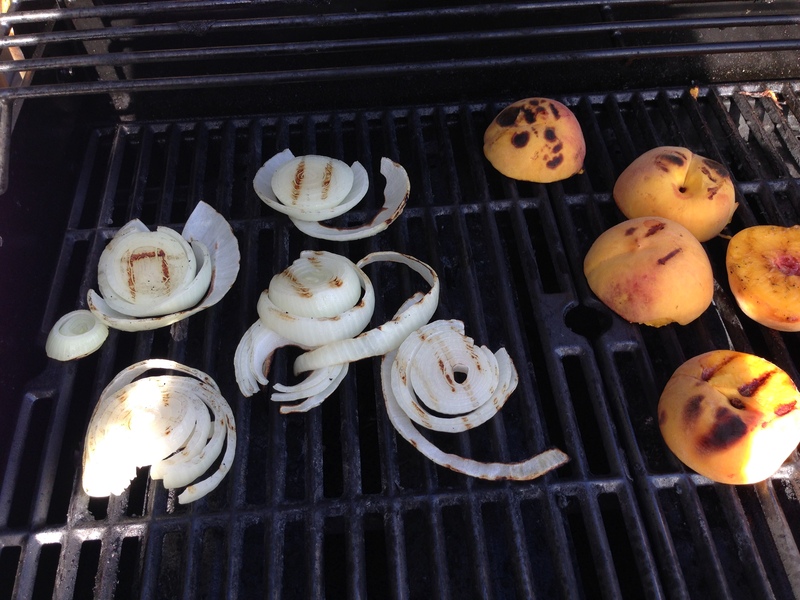 The peaches and onions grilled up beautifully! 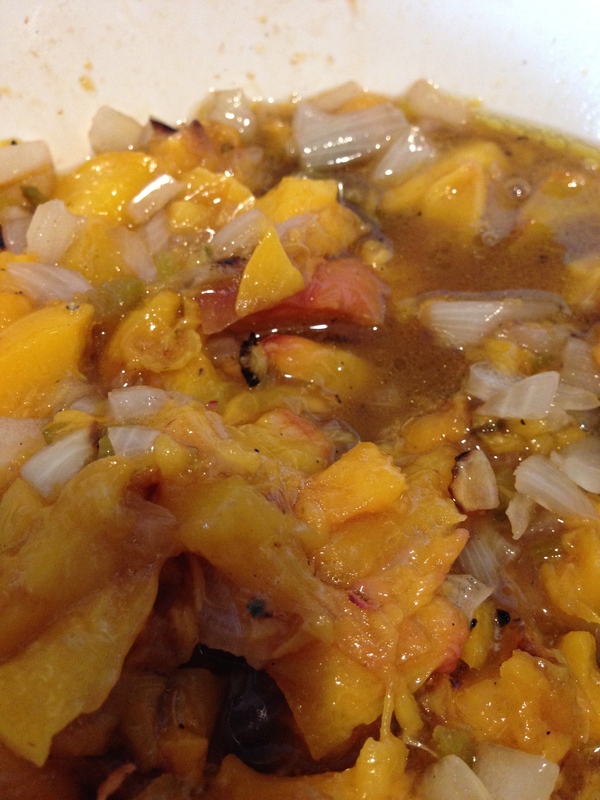 Next, I let the onions and peaches sit. While the peaches and onions were cooling, I grilled the chicken. I went light on the seasoning because I wanted the flavor of the salsa to stand out. When they were cool to the touch, I coarsely chopped the onions. They were soft and sweetly fragrant. On to the peaches. The fuzzy outside jacket of the peaches slipped right off. I chopped up that sweet peachy flesh and mixed the two together in a bowl. I added about a 1/2 of a chopped jalapeño (I should have grilled that too…Rats!). I also stirred in a little bit of cilantro, lime juice, olive oil, and just a dash of vinegar. A little salt and pepper completed the fresh salsa. The resulting salsa was fantastic! It was not my “prettiest” salsa ever, but it was really tasty! This was fantastic piled on top of grilled chicken. 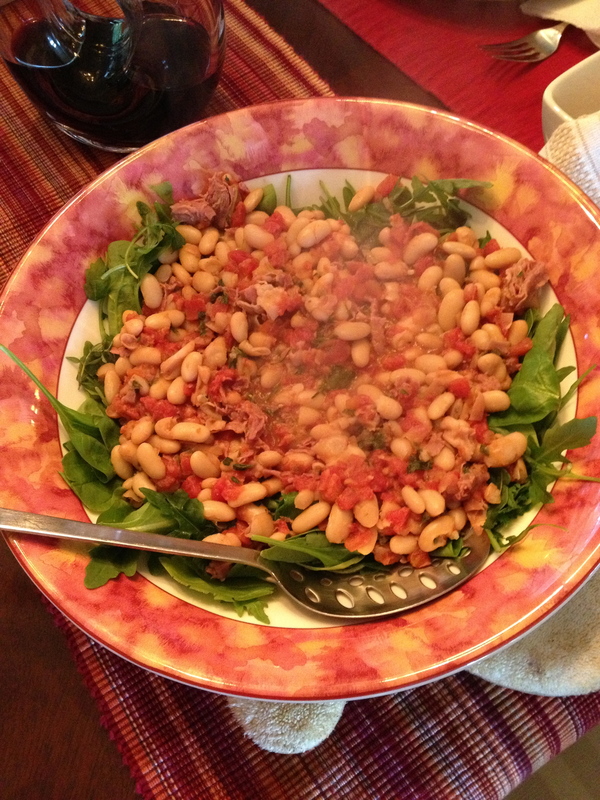 It was a healthy low fat option packed with nutrients and flavor! Dinner consisted of a crisp salad, leftover pesto pasta, and flavor packed grilled chicken slathered in peach onion salsa. It was a hit. So delicious and a fun way to use fresh ripe reaches. Cleanup was a breeze because I grilled most of dinner. Gotta love that! I am certainly going to try some more grilled salsa recipes. Tomatoes are at the end of the season, but there is surely enough time to get creative and grill those up next! Grilled tomatoes with perhaps some creamy diced avocados. Maybe roasted garlic too. Oh yeah, can’t wait for that one! It’s time to really dig into the fresh tomatoes and corn of the season. There are a million things to do with beautiful summer vegetables. I just love the versatility of grabbing some tomatoes and thinking of so many ways to use them. Speaking of the summer bounty…it’s time to make some fresh salsa. Who doesn’t love salsa, served with corn chips-I love the low sodium baked version-Now make some super fresh salsa from scratch. Fresh salsa is also great on meat and fish. It packed a punch of flavor, and you can make it as zippy as you want. Throw all these ingredients in a bowl. Give it a quick stir. Refrigerate. Yup, it’s that easy! A variety of other peppers chopped-they are bountiful in the summer! Grab the chips and a beer. Enjoy!